On days that I have errands to do in Kuta or Seminyak, I try to get everything done in the morning and then usually have a quick lunch before I head back to Sanur and the school run. A few weeks back, after a busy morning ticking things off my to-do list, I decided to go to Kafe Batan Waru which is across the street from Waterbom, Bali’s water park and very close to the Discovery Mall. I had heard many good things about this restaurant and was eager to find out what the hype was all about. 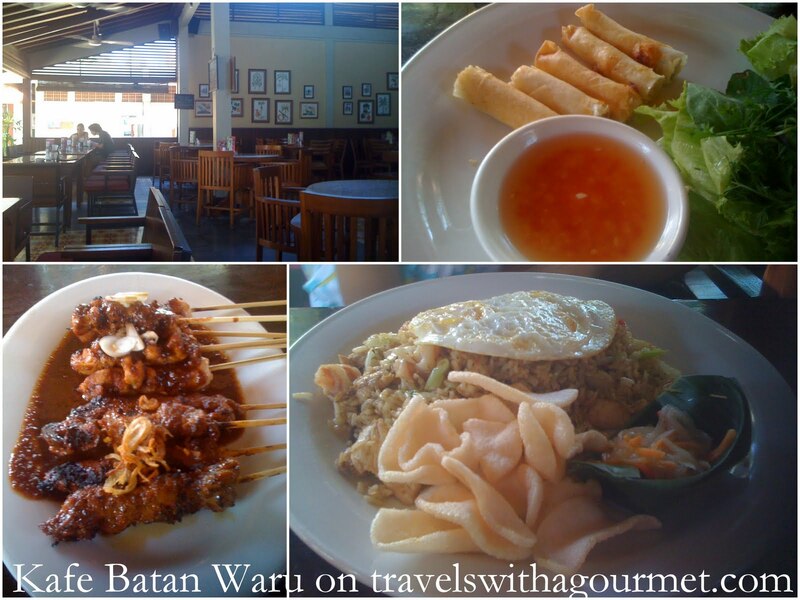 Kafe Batan Waru is an upscale warung with wooden tables and chairs, ceiling fans and an outdoor terrace. Their menu is extensive and has a mix of both Indonesian specialties and continental cuisine. I decided to stick to their Indonesian dishes and ordered the Vietnamese spring rolls for my daughter, nasi goreng for the nanny and a mixed sate sapi (beef satay) and sate ayam (chicken satay) for myself. The Vietnamese spring rolls were really just tiny lumpia and not the nems that I expected although it came with the usual mint and lettuce leaves to wrap them in. The nasi goreng of wok-fried rice with chicken and shrimp came with the usual fried egg, acar (pickled vegetables) and prawn crackers. It was good but could have done with a bit more spice to it. My chicken and beef satay was the best out of the three dishes – charcoal grilled tender chunks of beef and chicken served with a sweet peanut sauce. Usually served with lontong (sticky rice cakes), I asked for some nasi putih steamed white rice instead. All in all, the food was fine and a good place to try some Indonesian cuisine while in Bali.